A more delicate Tie Guan Yin then previous years. Aroma and color are excellent, fill your kitchen and body with gorgeous bouquet. Flavor is less intense more sweet and delicate. Beautifully crafted tea in gorgeous red package makes a perfect gift for your tea lover. Bought this tea for my friend again, in large amounts. Oolong teas can stay fresh for a while. Aroma is superior. Nice floral notes. I am glad that I bought 200gms of it. I love that tea. Very-very good! Thank you! Have a nice day and YES you will see me again. This has now become my favorite. Worth every penny. Smooth and taste is long lasting. Tried it in 2006. One of the BEST tea´s that I have enjoyed!! I´ve been buying tea from teaspring for my friend to try, and she was impressed with the quality of the various selections I picked for her- that I´ve tasted before and liked from previous orders. She wondered where I got such good tea. As her being a long time tea drinker, she already has a preference for Tie Guan Yin, so I ordered this Jade Tie Guan Yin- thinking it might be better than the standard, original one teaspring sells which I did not particularly like too much. I hope this order is a good one too! One of my favorites. Lovely floral flavor. Little costly but a very nice for a daily drink. I too have tried and favored Shen Yun Tie Guan Yin in the past, but elected to try Jade Tie Guan Yin. A very relaxing pleasant cool after taste, with a hint of flower aroma to it. Highly recommend. This has become my everyday TGY – the quality is very consistent, and they deliver it vacuum-packed on request (which helps, as I tend to order 2x200g at a time). I wish it was a bit cheaper for what it is, but overall cannot really complain. There´s nothing quite like the unique aroma and flavor of Tie Guan Yin. This particular variety is excellent, definitely superior to the standard. If you´ve happened upon Tie Guan Yin and are interested in taking it to the next level, this is definitely the tea for you. A very decent, smooth everyday TGY. Bought it again after a couple of years, liked it again and have just placed another order. I was my top favorite 2-3 seasons ago. It is still a very good green oolong, but it not as super like it should be. Замечательный чай, очень приятный цветочный аромат, насыщенный вкус! Good tea. big and clean leafs, nice aroma. Do recommended. Is one of my personal favorites which compliments my metabolism and is a great way to begin any day. I’ve also tried Shen Yun Tie Guan Yin of which I would definitely recommend, but am drawn to the Jade Tie Guan Yin as a step up and truly enjoy the aroma and taste. I begin each work day with two cups of this tea. Много лет заказываю, с приятным вкусом и тонким запахом. Замечательный зеленый чай. Good flavors and aroma but not as exceptional as I had hoped. Nevertheless, I quite enjoyed this tea. I have bought this tea again, an excellant oolong to be enjoyed daily. One of the best Oolong tea out there for the price! This tea needs only a brief rinse in a gai wan to produce a delicately perfumed liquor. si conferma un tea squisito fresco con quella particolare sensazione di aroma che dalla gola si propaga nel naso. sempre interessante il rapporto qualità prezzo. Fast delivery and great product! Will definitely purchase product again. Nice and smooth flawor. Good taste! Recomennded too all tea lovers. Wonderful. Absolutely wonderful. Far superior to shen yun TGY (but to be fair that was a different year, this is the 2012 crop). The leaves are clearly very high quality just by sight. What was most interesting is how varied the brews I got. Some were like Taiwanese oolongs, very creamy, while some were much more flowery, and other brews of this one tea were tangy, more like Darjeeling oolongs. Experiment with this tea! I used water 85-100 and brewed at times from 30s to 60s. A tea as beautiful to look at and smell as it is to taste. It´s nowhere close to tea king quality in any possible way (I had real 50g - $150 tea king TGY that won Anxi tea king tournament before), but it certainly has that particular TGY taste that most other "TGY" trash on the market lacks. A little bitter and vegetable-ish, but it is real, and all my non-tea-savvy acquaintances thought it was an amazing quality tea anyway. So yeah. My verdict? TGY for the poor. You won´t regret buying it. Aromatic and fresh. Though I am not convinced it was worth the money. this tea has a very light colour, has a soft taste and the good taste stays long in your mouth. I love it! A very good quality tea. Strong flavour and aroma although last year´s batch is slightly better. Like always, this is very aromatic. I love it! I am buying some more now! I don´t like the new, individual packages. It seems like there´s less tea than before. One of my favorite teas! I love the beautiful fragrance of Tie Guan Yin! It´s a keeper! Nothing exciting here. I´ve had other Tie Guan Yins that were at least as good, at half the price. Produces a weak brew on the first steeping, and there is nothing special about the nose or mouth of it. Don´t get me wrong - it´s a good tea. Just not special, and not worth the price. Fresh, fragrant, smooth but not oily, almost no bitterness, good for several infusions (you might want to shorter infusions than recommended). I have tried many different types and settled on three that I now continue to purchase on a repeat basis. Everyone who tries this tea loves it. Tastes to me like fish or seaweed. I did smell the orchid scent while it was brewing which was lovely. Хороший аромат, довольно неплохой вкус при первом заваривании, но какой-то битый лист, в отличие от других сортов. It´s because of teas like Jade Tie Guan Yin that I drink oolong. This tea provides a crisp, floral cup every time, without fail. One of the best oolongs I´ve tried from this site. I love this tea, it´s better than the King Series Tea - number 403 I´ve had for years. This is my first time with TeaSpring and I´m happy with the services. I´ll order more Jade Tie Guan Yin. Очень качественный и недорогой чай. Приятная свежесть. Strong floral orchid fragrance and sweet floral taste, with a clear pale yellow/green color. A little aftertaste. Multiple infusions. The overall profile is refreshing and soothing on the palate. Very smooth with no disagreeable harsh edges or astringency. This grade is much better than the less expensive TGY, which I have tried. JTGY has much more fragrance and tastes sweeter. The whole leaves expand beautifully. The very light oxidation and current year harvest offers a tea that is bright and very clean. Recommended. I´ve been drinking Oolong tea for about 6 months now and this is one of my favorites. I tried ordering from other companies and trying a variety of oolongs, mostly high mountain style. This teas I have ordered here are the highest quality I have found yet. The Jade Tie Guan Yin have dark bright green leaves that look and smell like a high quality tea should. This tea has a strong delicious sweet floral flavor and a golden yellow color. My wife said it is her favorite. I bought 100 grams to try it out and ordered 200 more a day later so I´ll have more before I run out. Overall a very good TGY indeed. Very strong floral smell and taste. Equally as good as last year´s. Sweet, flowered tea. With good taste. i will buy it next time too. Excellent tea, with easy pleasant flower aroma. I drink this tea many years, and it doesn´t cease to be pleasant. My favorite tea so far. Going to try regular TGY this time.Thank You! The Jade Tie Guan Yin fragrance contanis all of the fresh flavour of the forest after a summer shower. Excellent choice for the anybody who like the little oxidised oolongs more then the heavy ones. Personally this is one of my favourites for morning tea. I live in Russia. It was some time before my order arrived before me, but to get it was very nice. Tea of exceptional quality, fresh and delicious. I would like to receive future request in a more robust package, because it is crumbling in my hands. And, thanks to the company for precise work! Absolutely delicious Tie Guan Yin. The leaves are large and vibrant. A bit on the expensive side, but worth it. 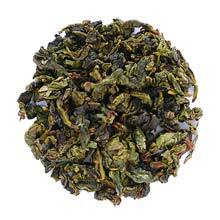 This is a upper-average Tie Guan Yin with a refreshing taste, less vegetable taste and hardly oily. It also recommendable if Shen Yun is too pricey for you. Great Tea. Became one of my favourite I will purchased again. Teaspring is the best tea retailer I could find in Internet in many other shops taste of tea is avrage but Teaspring`s is Superb!!! I can understand why it is popular.Has sweet fresh taste and very strong aroma. Maybe my palate isn´t sensitive enough, but this tasted rather dull to me. It´s not bad by any means, but for the money it should taste better than the cheaper TKY, which it doesn´t. This is one of the best oolongs I have ever tried. Not much left to say. I loved this tea, I especially like it´s wonderful smell. It says it should smell for orchids, cannot confirm that fact, but each time I drink it the fragrance is just amazing. I am trying to recognize it, as it reminds me of something, but cannot get it. Will definitely buy it again, must try if you haven´t! Mild, flowery and sweet, one of my favourite Tie Guan Yin. I have tried many of your teas to determine which one best suits me since I am somewhat of a novice regarding tea appreciation. In this case, it is as if someone designed a tea that perfectly matches my sensibilities and tastes. I will keep ordering this from now own. Just met oolng teas. And I am impressed. :) This tea is in my TOP 5 tea list for sure. Very light, sweet and delicate flavour. This is an excellent TGY, very floral and smooth without any dryness or astringency. Brew mine with 3g leafs with 100-120ml boiling water, sweet fragrant liquor in the first brew, subsequent brews are just as good but only able to last 3 good infusions for mine. Will definitely buy again. Tea: 4 g Water: 12 oz Dry the leaves were very tight. They unfurled nicely in the 1 minute long steep. Light yellow brew. Sweet aroma Sweet flavor. Not bitter or astringent. This is a very enjoyable tea. I like it. It is one of my favourite tea by far. It has a strong aroma and a sweet after-taste. My girlfriend simply loves it and she is going to order more of it! I usually take about 4 grams of tea for 150 ml. water, brew for about two minutes for the 1st & 2nd. I really like this tea! This Oolong is, at best, above average. With the recommended brewing guide, I feel it´s too overpowering with the vegetal flavor. Swishing the tea around the tongue, I would be able to detect just a hint of sweetness. The floral, vegetal aroma is quite inviting, however. I would recommend cooler temperature (175F), more leaves (4g per 150mL), and less time (about 15 sec for the 1st, 10 for the 2nd, and 15 for the third). This tea has quite good endurance, about 8 infusions. The taste of this tea is somewhat odd (reminiscent of cooked collard greens). Excellent tea as always. Super fresh aroma. I will order further. The best tea I have had. Incomparable aroma, subtle taste that is haunting. Easily eight cups per teaspoon of leaves. Excellent flavor, pleasant taste. This tea has become one of my favorites! This is my favorite green tea so far. The aroma is sweet and very refreshing. The taste is excellent, and it is not too strong. Of all green teas I have tried so far, this one is my favorite. I highly recommend this tea. This is my favorite tea. Tea Springs quality is far above other websites I have ordered from in the past. This tie guan yin has a special smell and taste. I love it! Good Tie Guan Yin. Nothing special but excellent for the price and pleasure to drink. This is a wonderful, aromatic tea. Has they lovely hyacynth aroma. Comfort tea, and good for daily use. Many infusions; at least five. Very pleased with the tea, the customer service, and shipping time from China to USA. Has a nice floral aroma but didn´t like the taste at all. For some reasons, I do not like this tea as much as in the previous times I´ve bought it. The rolled tea leaves seem smaller, the wet tea leaves were less uniform, more broken, and more importantly less aromatic. Nonetheless, the brewed tea is still jade-green and tastes robust & floral. Hitherto, the Jade Tie Guan Yin has been my "go-to" tea whenever I feel like a green, floral oolong. I probably will branch out more now and look for alternatives; however, I still enjoy this tea very much. Outstanding oolong, very complex taste, strong smell. Good for gong-fu brewing method. I truly recommend it to everyone, who like flower&fruitfull oolongs. As usual, excellent tea for any occasion. Will buy more. This is a very good Tie Guan Yin tea in aroma and flavor so typical for this kind of tea. The aftertaste lingers on in ones mouth for some time. I had a Tie Guan Yin 2008 autumn harvest and it kept its flavor for the whole year. Will see how this one will do in this respect. Very strange flavor not fit for my tastes--however, I may be brewing it incorrectly so I will give this a 3 star review rather than lower. Excellent oolong tea. Dry leafs have pleasant fruit (citrus) aroma. Tea is very subtle with pleasant aroma and taste. Suitable for multiple infusions. Highly recommended. One of the best oolong I have ever drunk. ottimo il rapporto qualità prezzo. ideale dopo un pranzo a base di pesce. I am definitely NOT a tea expert, so I can only describe how this tastes. It´s extremely light, yet the flavour is very persistent. The second I poured the tea, all I could think of was gardenias...and true to scent, this tea tastes very much the way a gardenia smells. The item description is accurate, though I´d say there is more than a ´hint´ of floral to this tea; floral was the first and last thing I tasted about this, though overall the floral and spring-like ´green´ notes are probably equal. Just for reference I should probably also say that there isn´t a tea in the world that I enjoy without sweetener, so I did drink this sweet. Sweetness emphasizes the floral taste...without it the ´green´ notes are a little more prominent. One cup and all your troubles disappear. Two cups and you´ll be flying in the sky. Best tea ever. Very lovely tea. Great aroma, fresh, brewed 10 times with a Guiwan. Would highly recommend trying this tea. Excellent oolong tea with full aromatic flavour and also soft. One of the best oolong teas ever. Good standard wulong for judging others, sweet and floral. Beautiful jade liquor and an awesome bouquet. This is the freshest tasting oolong I´ve drunk in a very long time. A light and refreshing oolong with a subtle and lasting floral fragrance and a beautiful clear yellowish-green color. Extremely smooth with very little astringency. Multiple infusions produces good results every time. A very elegant Tie Guanyin tea. If you are looking for interesting Tie Guanyin, I highly recommend this one. This is a pleasant and drinkable tie guan yin, not very floral though. I´m quite new to oolong teas, but this tastes amazing. It has a good 5 infusions and has a nice, full taste with a subtle sweetness. In many things, teas included, variety is desirable. Based on how many reviews I wrote of this tea (and backing out how many orders of the same I must´ve made), I should take my advice more often. This is a fine, and on many occasions an excellent tea, but even it can´t help diminishing marginal returns from setting in. What a pleasure it is to switch from drinking a green oolong such as this over to a dark, bold, and woodsy tea once in a while! So my homily is buy this tea, but pair it with something quite unlike it. The contrasts will help you enjoy both more! I´ve probably already exhausted the list of characteristics I personally find agreeable in this tea. I´d only like to add that it´s an excellent choice if you´re going to give teas as a present. Whether the potential recipient is a novice or seasoned veteran, there are so many immediately obvious reasons to like this tea (everything from its strong aroma, jade green liqueur, sweet lingering taste, to robustness to brewing parameters) that it (probably) can´t fail to please. Great aroma and a relaxing taste! This is probably my favorite tea overall. Just get it, hows that for a review. Seriously though, this is quite good. AS good as almost any I´ve had. Best brewed in a gaiwan so you can enjoy the color and the beauty of the leaves. More balanced than some tie guan yin, with a more pronounced ´spring rain´ note. The best Tie Guan Yin I ever drank. Nothing more to say. Just love it. This is my favorite Oolong tea. I prefer light Oolong as opposed to strong smoky ones such as DaHongPao. Truly a lovely tea. the more I drink it the more I come to appreciate its delicate fragrance and flavor. Ottimo; un rapporto qualità prezzo moto interessante. profumo e gusto persistenti 4 o 5 infusioni assicurate. Ideale dopo pranzi lunghi e gustosi. My favorite tea from teaspring ! always good and fresh. Good bat not the best, i like this.....tie guan yin is particular. sweet and floral taste. Prepare gong-fu style to fully enjoy this tea. has a wonderfull aftertaste and can almost compare to his much more expensive brother. great taste and aroma... the ratio of one bud two leaves is great... light, balanced... that taste that hits you about 5 seconds after, splendid! Jade Tie Guan Yin is smoother than a typical TGY in the same price bracket. This may not be to everyone’s liking (I prefer a hint of mint-like bitterness) but I reckon that some tea drinkers may want exactly that smoothness. As usual, the flavour can be made more pronounced by increasing the tea to water ratio and/or the infusion times, but I wouldn’t recommend over-infusing this tea. The leaves are of a rather rounded shape which makes them interesting visually. The colour and smell of dry leaves are very pleasing. One of my favorite teas. This is the third time I´ve bought this tea from TeaSpring, and I will certainly buy it again. Clean, crisp, and a great tea overall. This is an interesting aromatic tea.The taste develops through your mouth and the smell is subtile, floral.A little sugar might work! I like it as a delicate kind of Oolong. The subtle taste is pleasing for every sip. It will last for four or five infusions. I get this tea from teaspring often -- it is my favorite. I have tried other tie guan yins from other distributers but teaspring has the best i´ve tried. Its a good one! I love the way the flavour stays with me well after finishing a cup. I love how much this tea expands in my pot. 3g of the stuff in my 150ml yixing results in big green juicy leaves almost pushing the lid off by the second and third brews. Smells great too. As you might imagine there is a pretty strong green flavour to this TGY. If that rocks your boat then this tea will please. It is difficult to find something to dislike in this tea. Everything from the remarkable fragrance of the leaves (both dry and wet), the jade green infusions, to the robustness of the tea to over brewing are simply marvelous. I´d recommend this tea to all those who like floral oolongs as well as those who prefer strong green teas. I enjoy this tea. It also gets better with multiple infusions. 2008 spring harvest is very nice. A little less depth than fall but more of a sweet and floral quality. It reminds me of fresh cut pears and orchids. Some of the better greener Tie Guan Yin on the internet! After fifth infusion it becomes ordinary. There is nothing else I could add to a description of this tea. Do not cover it during infusion. Let the smell fill the space. Wonderful Oolong!! By far becoming one of my favorite teas. The Jade is quite impressive. I like it almost as much as the Shen Yun Tie Guan Yin. Excellent everyday Dragon Well. Many one bud with two leaves. Most likely pickred after the first pick. Quite the experience. Had this last night for the first time - floral and sweet, refreshing. Highly recommended. Excellent Tieguanyin. Aroma of fruit and roasted grain. Similar taste. The liquor is "thick and smooth," like the description says. The aftertaste stays with you for quite awhile. I didn´t detect any floral notes like the description mentioned, but I think it´s perfect the way it is. Thanks for the great tea! I got this tea soon after it was picked, and had one of the best tea drinking experiences of my life. This is probably my favorite tea overall. It has a wonderful sweet floral taste to it. Also, it is very different from the roasted Taiwanese version, for those of you who are wondering. The dry leaves of this tea smells amazing. Once steeped, the tea yields a clear, pale green infusion much like a green tea. It is, however, more robust than some green teas: hotter (around boiling) water can be used and the steeping time extended without the tea becoming bitter. Overall, a lovely tea. I love this tea! I drink it every morning. I just bought a 2nd bag. This is an ongoing favorite of mine. I recommend this as your regular oolong ! A very nice tie guan yin. Lasted me any infusions. This one was good and sweet! One of the better varieties of Tie Guan Yin that I have tried. Non siamo riusciti ad entrare in sintonia: forse perché amo il Dong Ding e il suo profumo fiorito; forse perché sono abituato ad un Ti Kuan yin molto fermentato e quindi più corposo e caldo; forse perché non sono stato abbastanza bravo a prepararlo. I think I liked this tea more the last time I had it. I don´t know if my taste has changed, but it just tastes a bit overpowering... I think I just like greens better than oolongs now. With that said, it is not a bad tea, just very flowery. Second time buying this tea and it wont be the last. I love every thing about it. A very sweet, flavorful and tasty tea. We use just a small amount into the cup and pour hot water over it - this can be done for several brewings. It continues to be one of our favorit teas. They don’t have a rating that can do this tea justice. in my opinion it is amazing flowery the picture they have of it doesn’t do it justice. When you get this tea the first thing you notice is the brilliant almost florescent green color of the tea. The tea leaves you with a feeling of well-being that lasts for hours. A tea that you want to share with. Truely outsatanding! This is my second time ordering this type of tea from teaspring. I love it and it is my current favorite !! highly recommended if you like a floral boquet to your oolong ! This tea is excellent. I was in Beijing last Spring and ’discovered’ tie guan yin tea for the first time. I bought maybe 100g of it from a small shop in Beijing and quickly went through it at home. I live in NY and thought I’d be able to find similar quality oolong in Chinatown, but alas, I have yet to find anything that compares to it. However, this Jade tie guan yin gets very close to the taste of that tea I brought home. Very pleasant and memorable finish. A decent example of Jade Tie Guan Yin. I’ve had others with flavors that I prefer more than this. It smells like flowers and tast good. I drink it for a good start in the morning. Very high quality product. One of the best oolong i have ever tasted. Perfect still at the 4th infusion, rich in taste and flavour. Fantastic Tie Guan Yin! Tea leaves and infusion have a wonderful colour and aroma. what can I say? I’m amazed at this tea. It’s light and floral, but had amazing staying power. I will easily lasts 7 infusions if you keep an eye on your steeping time. Not THE best, but it’s very hight quality.... You’d have to pay obscene amounts of money for something slightly better. Nice fresh and fragrant TGY, not an oustanding batch but nevertheless very enjoyable. Great oolong. The overall experience isnt as strong as i expected, but longer steep times might fix that. i like it. A pleasant Tie Guan Yin, a bit too delicate. Should be drunk quickly. The aroma is flowery when fresh, and the taste is weak but pleasantly refreshing. Jade has the color of fresh green & gold . Incredibly smooth and silky on the tongue. Superb quality and aroma. Probably the best tea I’ve tried from TeaSpring. My first experience with this tea. I like this tea. It has nice sweet floral taste. This is one I’ll likely get again in the future. Unforgetable smell and taste. Second time to buy it!! not as good as my last batch but still a nice floral sweet taste. Probably one of the nicest Jade Tie Guan Yin teas I’ve had. Good color, wonderful aroma and taste. Never forget!! a very nice tea, the aroma is sweet and unchallenged among the other teas I have had so far, nice! Really fine aroma, but a little light on the tongue. It didn’t knock me out like I might have expected. Another winner! This tea is almost as good as the more expensive ones. Perfect for an everyday tea Guan Yin smells sweet and fresh. excellent tea, nice color, flavor and aroma. Will recommend to any green tea lover and for those who are open to try green tea. what’s not to like? you gotta be nit picking to dislike this tea. nice floral on the nose and palate. yum. i’m loving this tea. My first experience with this tea. I’m more experienced with Formosa oolongs. I did really like this tea. It has nice sweet floral taste. Very refreshing after dinner. This is one I’ll likely get again in the future. I like no tea better than this Tie Guan Yin. Truly Memorable througout the day. The perfect tea. Strong aroma. Flowers, lightly sweetness. Aromatic and very satisfying green tea, with a vegetative aroma. This is a fine tea indeed. Good smell and taste... one of my favourites. Thanks TeaSpring! The tea is exactly as I remember it -- a light and delicious oolong to enjoy on a daily basis! Though a lovely tea I found the vanilla like flavor to be overpowering. This bag was even better than my first...nice honeysuckle nuances with just a superb aroma. There may be better more expensive examples of this tea...but I did not hesitate to reorder and will order again. Tie Guan Yin is one of my most favorite ever kinds of oolong, and this one just gets all the more wonderful, because it doesn’t only taste good. It looks pretty. When you first smell the aroma of this tea you know that when it is finally brewed, the taste will not only compliment the aroma, but surpass it. Ti Guan Yin being one of my favorites, this one was the definitely best of the greener variety to my experience. Also if you own this tea and you also own Bai Ji Guan, I’ve found that if you have Jade Ti Guan Yin, right before having Bai Ji Guan, the flavor of the Guan Yin still lingers while enhancing the experience of Bai Ji Guan. Excellent green TGY tea, very flavorful and smooth, will definitely reorder. The best Tie Guan Yin I have tasted! This tea had delicate bright green curled leaves and a tremendous flowery fragrance. Good for many infusions and delicious. Highly fragrant, sweet all the way through. Fun just to smell! Would buy again. A bit musty flavour, no that much of a typical TGY. Very thick leaves. Not a first grade Tie guan yin. Excellent, with superb flavor and smoothness. A very enjoyable tea. Is the great tea for me, the smell and the fragrance is excellent, it recommended must try it. Very Good Jade Guan Yin. I would buy again. As soon as you open the bag, it smells like a spring meadow. It is not a strong tea, still, very enjoyable. I suggest using a lot of tea and brewing at least 4 minutes for the first infusion and longer for later infusions. I experiences with TeaSping itself have always been excellent. I think they are the premier place to find a rich variety of Chinese teas at an affordable price. Bravo!! Light and aromatic Oolong, one of my preferred. Very good to taste and a superb aroma. More sweet flavor than the other green oolongs I have tasted this year to go along with the very nice sweet floral fragrance. Very refreshing and delicated, great tea. Very Good tea for such a low price, beginners should try it as a first tea. Orchid taste is very persistent. But not a first grade Tiguanyin. I love this tea. It is the best Tiguanyin I have had. It has a nice deapth of flavor, without astringency, even when strongly brewed. The flowery aroma is noticable, nearly overwhelming and the quality of the tea is high. I enjoyed this tea because of its rich taste, but some people note its floweriness is a little off putting. Its very fresh! This is an excellent TieGuanJin, for a fair price. The flavour that emerges when brewing the tea is indead exquisit, quite a unique effect. The taste is very smooth, mild, with grassy and flowery note, like a spring meadow. The taste varies over the different brewings, the second and third are usually the best. The aroma of this tea is fantastic, strong, and very floral. The infusion will yield a beautiful green jade colour. The taste is equally as fantastic with a strong floral note that is very refreshing. If you like a floral aroma and taste then this is worth a try!